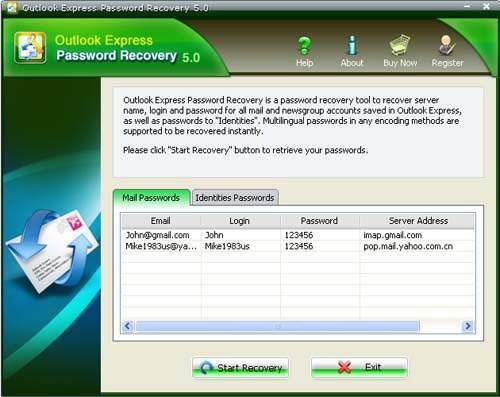 Tips: Below are the steps to recover server name, login and password for all mail and newsgroup accounts saved in Outlook Express, as well as passwords to "identities". To see the detailed information, please refer to the "Help" document integrated in the program. Step 1: Start the program, then an interface will pop up. Select the "mail password" tab. Step 2: Click the "Start Recovery" button, all mail accounts and their related passwords will be shown in the column. Step 1:Start the program, then an interface will pop up. Select the "identities password" tab. Step 2 : Click the "Start Recovery" button, all the identity of the outlook express users and passwords will be shown in the column.